By now you are hopefully planning your wedding your way, you have graciously accepted a little financial help from your mom and you are wearing that gorgeous white gown that you initially walked away from because your granny pointed out that you are no longer a virgin. I’m not entirely sure why but apparently the misguided consensus seems to be that it is better for you to just pretend that you current relationship does not exist. All those uptight people will feel far more comfortable this way. Darling…announce that wedding! Post seventeen pictures of your engagement ring on Facebook and ring bells and blow whistles if you want. You’re engaged?! That’s fantastic news! Tell the newspapers. Tell the world. Well, if you buy into this particular rule then you are going to need to clear that with your bridesmaids because I’m pretty sure they’ve been in a corner giggling and making plans for your hen night ever since you asked them to stand up for you. Who makes these rules anyway? Huh? Don’t these people know you lost half your stuff in the divorce? Can you imagine getting ready for a wedding and your plus one asks you, “Hey honey, what gift did you get?” and your response is “Oh this is her second wedding so I didn’t get her a gift.” Of course not! 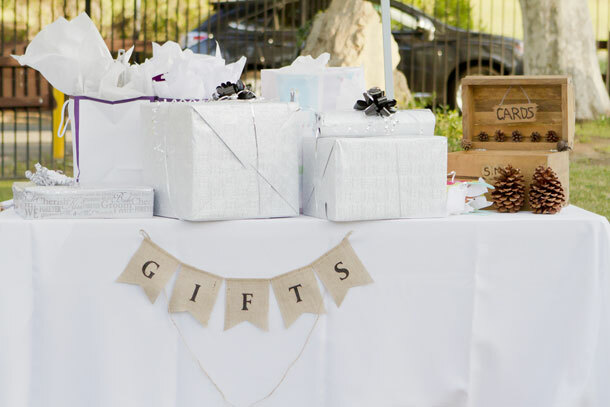 Granted second weddings do kind of mean that it is likely that you are pretty set up as far as spatulas and towels go, but that does not mean that there is no room for gifts. It is completely fine for you to register somewhere if you want, otherwise just make sure that whoever is handling your RSVPs knows what kind of gifts to suggest if anyone asks. So you see? All that second wedding anxiety is kind of silly. Instead of worrying about propriety and what everyone else is going to think, revel in these moments. Second chances are a beautiful thing. And you know what? There is a kind of wisdom that goes along with having done this all before. Use that wisdom and have fun! A wedding is a wedding.. It is the coming together of two people who love each other … It shouldnt be any differernt to your first, second or even third wedding … Ignore the myths, marriage is a beautiful thing and should be celebrated the way you want it.